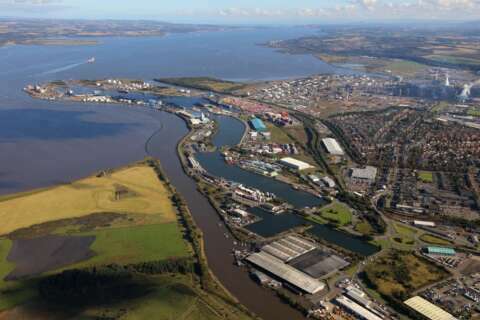 Grangemouth is Scotland's largest container port and lies at the centre of Scotland’s industrial heartland. The port is situated midway between the main Scottish cities of Glasgow and Edinburgh, and is served by the M9 motorway, which links it to the national motorway network, and is also rail linked. Approximately 9 million tonnes of cargo are handled through the dock facilities each year. Of this, 2.5 million tonnes is dry cargo, which represents incoming raw materials for Scottish Industry and outgoing finished product. As Scotland’s main container terminal, the port handles approximately 150,000 containers per year. As much as 30% of Scotland’s gross domestic product (GDP) goes through the port. It is the UK’s largest feeder port and the only one that exports more than it imports. Grangemouth’s location at the centre of Scotland’s main areas of production and consumption, its road, rail and sea links, and its land availability makes the perfect combination for the port’s further development as a logistics and distribution hub. Future plans include increase of container terminal capacity, possible Biomass Plant Development and additional Port Warehousing.